The MQ-9 Gas sensor makes it easy to monitor carbon monoxide and combustible gas concentration levels using our I2C Mini Module form factor. The MQ9 is connected to an ADC121C 12-Bit Analog to Digital converter, which is capable expanding to 9 gas sensors per I2C port using just two address jumpers (making full use of the floating address system). The MQ-9 is capable of sensing carbon monoxide air concentration levels between 10 and 1,000ppm and combustible gas air concentration levels between 100 and 10,000ppm. The ideal sensing condition for the MQ9 is 20°C ±2°C at 65% ±5% humidity. An internal preheater inside the sensor helps achieve the ideal sensing conditions, but the datasheet recommends over 48 hours for preheating to achieve optimal accuracy. 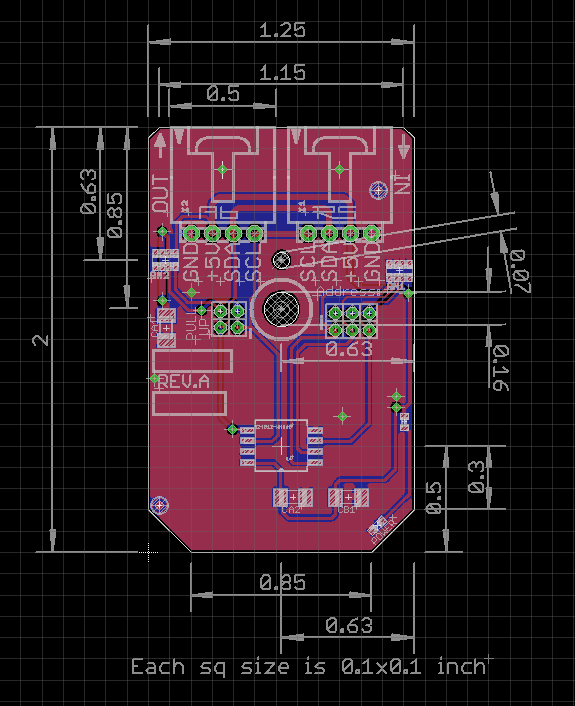 Because of the internal preheater, this sensor requires more current than most of our I2C Mini Modules. We measured 139ma for this I2C Mini Module so we strongly recommend planning a power strategy for your I2C master device to deliver no-less than 150ma per sensor! This sensor comes pre-calibrated to the datasheet’s recommended values; however, final calibration may be required for accurate measurements, as we do not stock the equipment for full-scale calibration of these sensors.